Screen shot of the Post-Gazette's award-winning coverage. Just when it seemed like things could not get any stranger for the Post-Gazette in recent months, the Pulitzer Prizes were announced on Monday. Even as it seems active shooter events have become a regular occurrence across the United States (in fact the South Florida Sun Sentinel also won a Pulitzer for mass shooting coverage), the Post-Gazette’s reporting of the incident stood out in many heartfelt ways. The moment that seemed the most poignant to many was when the newspaper ran the Jewish mourner’s prayer in Hebrew across the banner. “When you conclude there are no words to express a community’s feelings, then maybe you are thinking in the wrong language. Shribman, who won his own Pulitzer for beat reporting in 1995 with The Boston Globe, also wrote a heartfelt column about what it was like for the shooting to take place in his neighborhood. He talked about how “the knotted fringes of tzitzit are familiar features at the corners of the garments of the Orthodox who walk through the area just before sundown Friday evenings” and how shock and sadness filled the air. 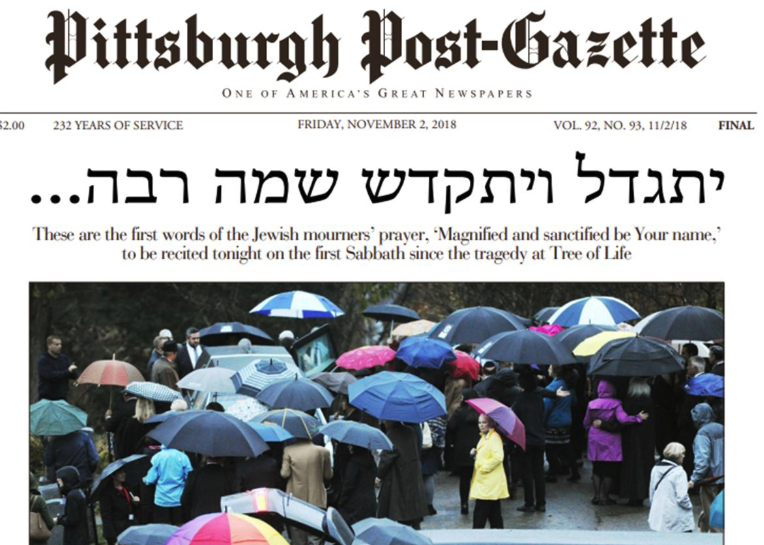 Of course, what makes this moment especially awkward for the Post-Gazette and its owners is that Shribman no longer works for the newspaper. He abruptly resigned less than two months after the shooting. The newspaper’s publisher John Block Jr. ranted about Shribman in the newsroom this winter, boasting that he had fired the former executive editor. On Monday, Shribman appeared in the Post-Gazette’s newsroom to celebrate the Pulitzer announcement. He asked the staff to observe a moment of silence to honor the victims of the shooting. Sally Stapleton, the newspaper’s managing editor at the time of the attacks, stepped down in March. The fact that the Pulitzer recognized the staff also creates an uncomfortable moment for ownership. The Newspaper Guild, which represents newsroom employees, continues to fight for a new contract. Most employees are wearing union solidarity buttons on their shirts and the guild has hung a huge sign in the newsroom that reads, “Shame on the Blocks!” Guild members haven’t had a raise in 13 years. The Blocks’ difficult day didn’t end there. 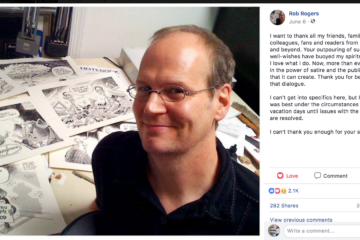 The Post-Gazette’s staff had one more reason to celebrate: The Pulitzers recognized one of their former colleagues, cartoonist Rob Rogers, as a finalist in editorial cartooning. 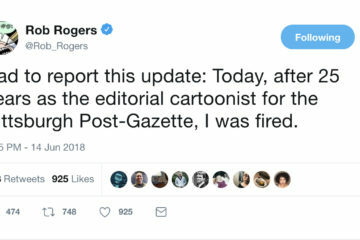 Of course, the Blocks fired him from the staff last summer over disagreements about whether he created too many anti-Trump cartoons. 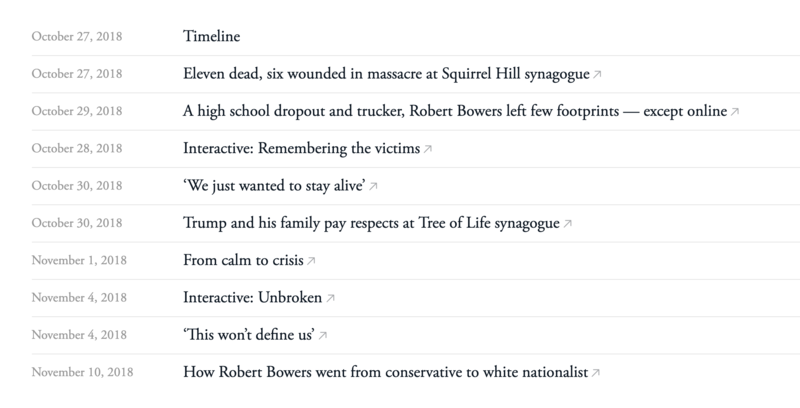 The series of nine articles that won the Pulitzer for Breaking News were under the bylines of these Post-Gazette writers: Kris Mamula, Andrew Goldstein, Paula Reed Ward, Liz Navratil, Shelly Bradbury, Bill Schackner, Rich Lord, Christopher Huffaker, Ashley Murray and Peter Smith. A huge congrats to all! In a separate local connection this year – unrelated to the Post-Gazette – author Eliza Griswold won a Pulitzer in the General Nonfiction category for her book “Amity and Prosperity: One Family and the Fracturing of America.” The narrative follows the story of a family in Amity, Washington County, Pa., as it deals with the consequences of the region’s fracking boom.